The following post is a re-creation of the Realpolitik NEWSLETTER sent out by BREAKING ALL THE RULES (BATR.org). BATR’s excellent post actually begins below the double line right under our site name and date. It’s no accident of fate that this outstanding newsletter was just sent to the SOTN Editor. The SOTN team had been looking for the real villain responsible for propagating so many outright lies and falsehoods about the fake news scandal known as the “Trump-Russia collusion” story. It’s a story alright…a real whopper indeed! Within the political firmament, the most obvious leaker of false info, privileged info and classified info — since the very beginning of this hoax — has been the Democratic Congressman from California’s 28th District—Adam Schiff. What makes this hoax so perilous to the American Republic is that it has devolved into full-blown witch-hunt… which could end up triggering a war with Russia. Adam Schiff: A Wackadoodle on a Witch Hunt ‘Controlled By Pizzagate’? 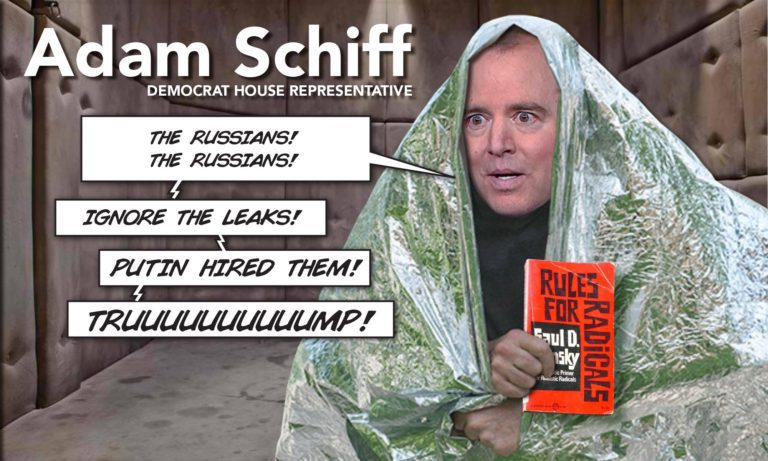 Because Schiff has degenerated into such a terrible menace to society, SOTN feels that he ought to be exposed like no other member of the U.S. Congress. Toward that end, this news platform is commencing with an ongoing multi-media campaign to reveal the naked truth about this exceedingly treacherous government official. The SOTN investigative journalists did not even have to produce any original content for the inauguration of this critical truth-disseminating campaign. That’s because the following BATR newsletter stands as a uniquely powerful piece on the treasonous Adam Schiff, a truly “Dangerous Traitor, Reckless Warmonger and Criminal Politician”. Pasternak raises thousands for Schiff, and Schiff raises millions for Pasternak. It’s a sweet deal all around. Schiff bloviates that his campaign to restart the cold war with Russia is an ideological crusade: “We are involved in a new battle of ideas,” he avers. “Not Communism versus capitalism, but authoritarianism versus democracy.” Yet this is about capitalism – crony capitalism of the sort that enriches both Schiff and Pasternak. As Major General Smedley Butler put it in 1935: “War is a racket.” And Schiff is one of the biggest racketeers in Washington. The cynical, absurd campaign to tar the Trump administration as a Russian plot to take over America is based on noting but lies, innuendo, political opportunism, and naked greed. Trump famously pledged to “drain the swamp” that is Washington, D.C., and it was inevitable that Schiff, one of the nastiest of the swamp creatures, would arise from the muck screeching in protest. 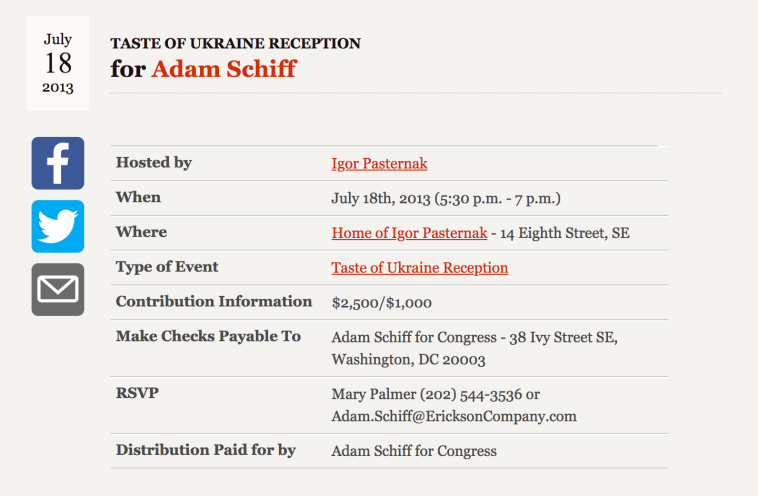 A Ukrainian billionaire oligarch, with military industrial complex contracts, funding Adam Schiff’s campaign dinners at $2,500 a plate…no wonder Schiff is pushing the Russia fear mongering so hard. Schiff’s hate for Trump and hate for Russia, can be easily explained by the money he appears to received from his oligarch patron, who has an agenda to neo-liberalize Ukraine, and profit from the pillage started in Maidan in 2014. One trademark of Schiff’s leaks to the media is that they’re frequently process complaints. In December, a media outlet ran with Schiff’s process complaint alleging that House Republicans were “quietly” investigating perceived corruption at DOJ and the FBI without notifying minority members. Schiff is portrayed by many in the media as being a straight shooter. His record in reality is of fanning the flames of absolutely every single Trump-Russia collusion allegation out there. Just this past week he pushed the false claim that Americans’ desire to see the House Intel Committee’s memo was in reality a Russian bot operation. Despite being a ranking member of an oversight committee, he lacks curiosity and interest into potential abuses at the FBI. White House problems with the Democrats’ “rebuttal memo” on the surveillance of Trump associates are genuine and the document could disclose “sources and methods,” California Rep. Adam Schiff, the ranking Democrat on the House Permanent Select Committee on Intelligence confirmed. He shared the House Intelligence Committee majority party’s “point by point refutation” in a press release to reporters, which links to a PDF on the HPSCI website. There is also a one-page “key points” document from the committee majority. House Intelligence ranking member Adam Schiff, D-Calif., meanwhile, released his own “fact sheet” to supplement the minority party’s memo. “Some time ago, Republicans on our committee released a declassified memo that omitted and distorted key facts in order to mislead the public and impugn the integrity of the FBI,” he said in an accompanying tweet. ‘Liar’ Adam Schiff is just made another UNHINGED Russia claims, and it’s a DOOZY! – Despite terminating their relationship with Steele over leaking to the media, the FBI vouched for Steele’s reputation in the FISA application in order to overcome the fact that most of the dossier’s contents were unable to be verified. – Signing off on the FISA applications for the FBI were James Comey (three times) and Andrew McCabe. Signing off for the DOJ were Sally Yates, Data Boente and current Deputy AG Rod Rosenstein. Fast forward to Uranium One and Fusion GPS and evidence of actual collusion and coordination between the Clinton campaign, the DNC, and the Russians, and we find ranking member Schiff once again acting as a surrogate for both President Barack Hussein Obama and former Secretary of State Hillary Rodham Clinton. He cannot do both. Nor can he ignore evidence that Team Hillary conspired with the Russians to both influence our elections and to engage in arguably treasonous pay-for-play in exchanging control of 20 percent of our uranium supply, the raw material for nuclear weapons, for $145 million in donations to the Clinton Foundation. Schiff was the individual who called the heroes who fought off terrorists from the roof of the CIA annex in Benghazi liars for their account of the Obama/Clinton administration’s denying security improvements, ignoring warnings of the attack, and the issuance of a stand-down order for any rescue, an order they ignored. As Investor’s Business Daily recounted in 2014.